On my hiking trip to Italian Alps I did short stop at the place I didn’t know it exists on the border of Italy,Austria and Switzerland. 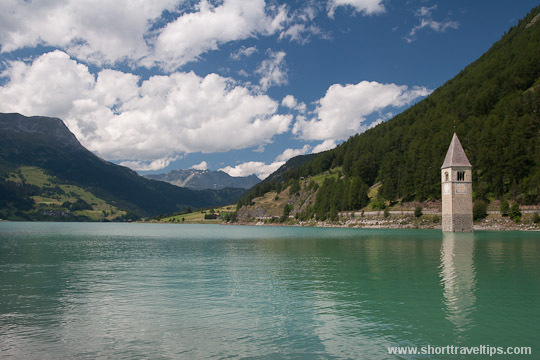 In 1940-1950s the natural lake Reschensee (lake Resia) was dammed up by 22 meters for electricity generation. Because of this 70% of the population were forced to emigrate or move away, almost 200 houses and farms were destroyed and people who decided to stay lived in temporary barracks for two years. Bell tower of church of Curon Venosta is everything left above water level. This place is so pretty and great shot. What a tragic story for such a beautiful place. Interesting story but woah- that is breathtaking. What a unique piece of history. So pretty and so sad! It’s such a nice place! Is the place still used for electricity generation until now? Very nice shot by the way. Elena, yes it still working.